Second floor single bedroom Condo. Fold out couch in living area. Vaulted ceilings. Lanie. Kitchen, oven, micro-wave, dishwasher. Eating area. Living room. Full bath. WiFi is provided and included in rental fee. Flat screen TV. The second floor Lanai over looks the pool. The pool is heated and is 20 feet by 40 feet. You also have a view of the canal as the condo units are located on Rubicon Canal. One of the widest canals in the Cape. Located on Rubicon Canal. 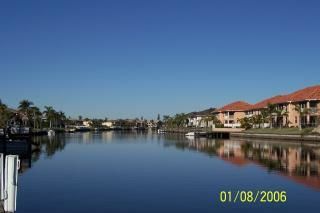 One of the widest canals in Cape Coral. Designated under a car port. Large swimming pool. (20 x 40 feet) Washer and dryer in common area. Located on one of the widest canals in the Cape. The Condo is located 30 miles north of Naples. Thirty minutes from Fort Myers beach. Thirty minutes to Sanabel and Captiva. Three miles to the Cape Coral yacht club and fishing pier. Plenty of golf courses. Abundant fishing charter opportunities. Twenty minutes to downtown Fort Myers and the Thomas Edison estate. Cape Coral library is excellent. Monthly Rate: $1965 - $1965 Association by-laws require that the Condo must be rented for a minimum of a month. Rates differ depending on in or out of season. In season is January through April. All other months are out of season. A 10% non-refundable down payment is required to hold the chosen month.